Students will present their maps at the Historic Triangle Community Services Center in Williamsburg, 312 Waller Mill Rd. in Williamsburg, at 7 p.m. on Nov. 15 in conjunction with the celebration of GIS Day. All are welcome. View details. On Nov. 15, teams comprising undergraduate and law students from William & Mary will host a public presentation of maps of 11 Virginia House districts they created as their final projects for a new course titled "Legislative Redistricting and Geographic Information Systems (GIS)." Professor Rebecca Green, co-director of the law school's Election Law Program, and Robert Rose, director of William & Mary's Center for Geospatial Analysis (CGA) created this four-week, one-credit course. In a few short years, every state in the country will use the 2020 U.S. Census to redraw their voting district maps. This redistricting process is often fraught with concerns that lines have been manipulated to protect or promote partisan interests and in some cases dilute the voting strength of minority interests. After last year's Redistricting Symposium at William & Mary Law School, Rose and Green decided to develop a course that would challenge students to learn districting software to create legislative maps. 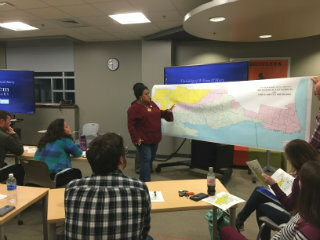 As the final project in the course, students were tasked with using a GIS tool created specifically for the course by CGA Fellow Kira Holmes to create maps that were compliant with state and federal constitutional and statutory law. Green said they shared the idea with Brian Cannon '04, J.D. '11, who is executive director of OneVirginia2021, an organization that advocates for fair districting in Virginia. While in law school, Cannon was a member of one of the two William & Mary teams that took home top honors in a 2011 Redistricting Competition sponsored by the Watson Center for Public Policy at Christopher Newport University and the Public Mapping Project. Cannon had the idea for students to map 11 districts in Virginia under scrutiny in Bethune-Hill v. Virginia State Board of Elections, a case alleging racial gerrymandering heard last term by the U.S. Supreme Court. In March, the Court found that a federal district court in Richmond had applied the wrong legal standard in its review of 11 Virginia districts. The professors decided to focus their course on those 11 districts, and, in a fortuitous coincidence, said Green, "the timing was perfect." Shortly after the class began in October, the federal district court in Richmond began re-examining the disputed districts using the new standard. Rose and Green said they were initially concerned about whether it would be possible for students to learn how to use GIS tools and also gain an understanding of the legal complexities in a four-week course. They decided that limiting enrollment to a small group of 16 students arranged into four teams would help the class get up to speed in a compact timeframe. They made sure that each team included a law student who had taken Election Law and an undergraduate who had taken a GIS course at William & Mary or had other GIS experience. They also invited guest speakers from across the political spectrum to share insights into the wide array of factors that affect where district lines are drawn and the potential consequences if the process goes awry. "We were pretty nervous going in to it, honestly," said Rose. "But what we had going for us was fantastic students, and we see this across the board at William & Mary. If you give them a task to do, they find ways to get it done. They really came through." Kaitlyn Hudenburg '18 is an economics major minoring in environmental science and policy, and was among the four undergraduates in the class. She had taken Rose's Introduction to GIS class and was eager to get more practice using it in the new course. She said she gained a deeper appreciation of the complexity and consequences of the legislative districting process when Del. Marcia Price of the 95th District visited the class and spoke to the students about her district's demographics. "The difficulty of our task became even more evident when we took into account the various socioeconomic factors that came into play when creating districts," Hudenburg said. "[Price] made it apparent that changing a single block could have an impact on her district, and she wanted us to realize that these lines really can make a difference in the elections." Other guest speakers included former Virginia Attorney General Ken Cuccinelli, Marc Elias, partner at Perkins Coie and the attorney who argued Bethune-Hill before the Supreme Court and Walter Olson, a senior fellow at the Cato Institute. Ben Williams J.D. '18 had taken Green's Election Law course, and also had considerable knowledge about districting in Virginia that he gained through a two-semester externship at OneVirginia2021. He said he saw the new course as "an opportunity to get in the weeds of redistricting and actually do the things I'd been reading about, either in case law or in statutes, for nearly two years." He said it was great to see the undergraduates and law students trading ideas as the course progressed. He and Hudenburg were members of the same team. "The majority of Kaitlyn's contributions on our team were with GIS first — just as the majority of my contribution to the conversation was legal at first," he said. "But as I shared election law knowledge and she shared GIS knowledge, we ended up being much more well rounded as the process continued. By the time we finished our maps, the undergraduates and law students were all contributing both GIS and legal aspects to the drawing of each of the districts." Green said she was delighted by the interesting array of approaches that the teams brought to their final projects. "The students really exceeded our expectations," she said. Hudenburg said that both professors "created a comfortable atmosphere where people from different disciplines could come together and simply learn from each other." As 2020 nears, arming students with GIS skills and an appreciation for the legal complexities in legislative redistricting creates real opportunities for William & Mary students. Whether they help to educate fellow citizens as the 2020 process unfolds or get involved more directly in state mapping efforts, the class prepared students to play a meaningful role. W&M’s Youth Mappers Chapter All Over the Map!, the Center for Geospatial Analysis (CGA), the U.S. State Department’s MapGive Program and the President's Emergency Plan for AIDS Relief will co-host "Mapping for Africa" at the CGA in Swem Library on Nov. 15 beginning at 5:30 p.m. Visit Facebook for more information.